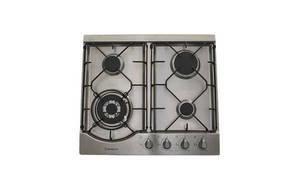 Snapshot: The Westinghouse WHG644SA gas cooktop has 4 burners and flame-failure protection. How well does it cook? Good results in our rice test. Good results in our stir-fry test. Lighter-weight trivets are easy to lift. Has flame-failure protection (the gas shuts off). Very good burner layout (wok and simmer burners at front). A small child could reach the controls.